Washington, DC (March 15,2017) - The Washington, DC area is a melting pot of beauty that comes in different shapes and sizes, showcasing beauty in every essence. On April 15th at The Sphinx Club at Franklin Square, District of Curves: The Washington, DC Full Figured Fashion Show, who is celebrating four years, will be happening in the Nation’s Capital. The Curvy Community, which is now very much a thriving one will be bringing the many expressions of life to the runway, through fashion and style. 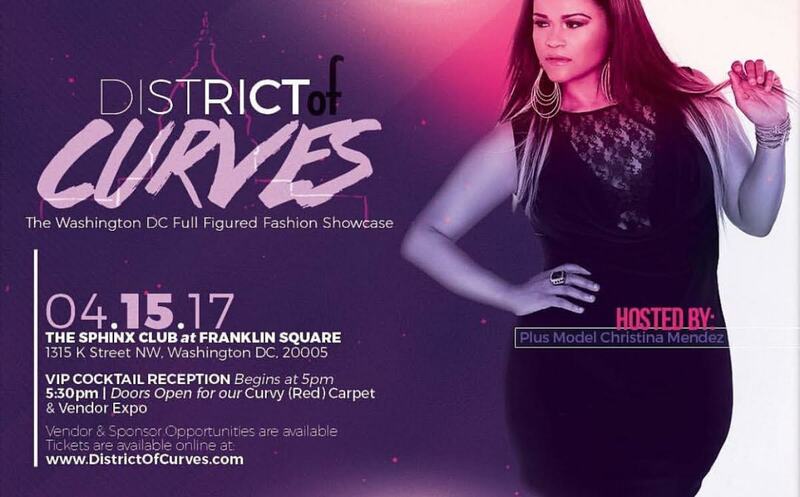 The 4th Annual District of Curves: The Washington, DC Full Figured Fashion Show will be hosted by Plus Size Model Christina Mendez, who is a popular model that inspires women globally to love their curves! A new addition to District of Curves is the Big & Tall Men’s Showcase! Creator Mickey Leon states “The plus size movement has made great strides over the past couple of years and now it’s time to add men as well! Big & Tall men have struggled to find stylish clothes for some time but that has changed and we are so glad to showcase the latest trends in Big & Tall Men’s fashion”. District of Curves is also proud to announce that Fashion to Figure is a featured sponsor and featured designer and additional featured designers are the following: Odd One Fashion, Honeysuckle Atelier, Total Chicness, Shimmy Sista, Ricee’s Pieces Designs & more to be announced. The featured boutique is Cute Thick Apparel and The Winston Box, which is a subscription based company based in California that specializes in Big & Tall Men’s apparel will be on site as well. Attendees are definitely in for an eye catching production at the 4th Annual District of Curves, as well as the VIP ticket holders enjoying the VIP Cocktail Reception at 5 PM, followed by the doors opening to the public at 5:30 PM, and including the opening of the Curvy (Red) Carpet and Vendor Expo. To purchase tickets, or for more information on vendor or sponsorship inquiries, please visit www.districtofcurves.com. To keep up with all of the latest developments, please follow @DistrictOfCurves on Social Media and ‘LIKE’ the Facebook page at www.facebook.com/DistrictOfCurves. If you're a media outlet or photographer interested in covering District of Curves, please send your inquiry to Candice@CandiceNicolePR.com by April 12, 2017.